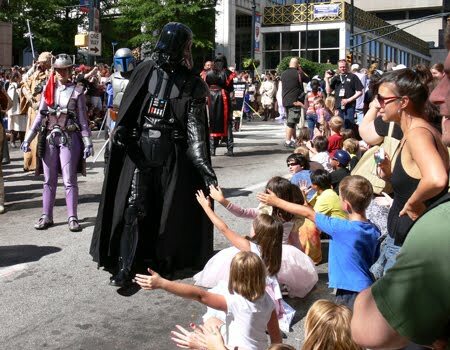 Darth Vader, Superman and Wolverine, as well as hundreds of superheroes and otherwise fascinating characters, marched down Peachtree Street in downtown Atlanta on Saturday morning to the cheers of thousands of wide-eyed, excited children and wide-eyed, excited adults. Hollywood invasion? Almost. 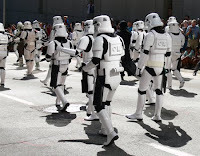 It was the annual Dragon*Con Parade. The Dragon*Con Parade is the largest event of the Dragon*Con weekend, the world's largest science-fiction/fantasy convention, held annually during Labor Day weekend. The Parade participants are registered 'members' of Dragon*Con—all in costumes from movies, television, comic books, fiction and self-made creations. 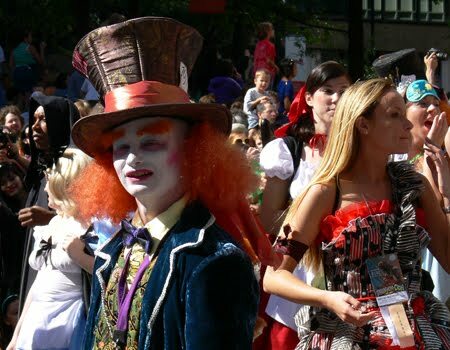 The highly-anticipated Parade is open to the public. I arrived about an hour before the Parade's 10:00 a.m. start time to secure a spot from which to make unobstructed photos, keeping mind to make sure the sun was in front of the procession, not backlighting it (I wanted clear photo memories, not the all too common movie poster silhouettes). From the corner of Peachtree Street and Baker Street, I could hear the crowds cheering immediately before the Parade participants rounded the corner. The Parade was packed with fan favorite characters, but the kids seem to like Darth Vader the most. He very graciously forewent the Star Wars Vader March to shake hands and give "high fives" to kids, who were on their feet in excitement and many of them in costumes themselves. The Parade also features celebrities. This year, Gil Gerard, best known for his role as Buck Rogers in "Buck Rogers in the 25th Century," perched on and waved from a sparkling new black Ford Mustang. Also participating in the Parade was Kevin Sorbo, well-known for his television roles as Dylan Hunt on "Gene Rodenberry's Andromeda" and Hercules on "Hercules." The years have been good to Sorbo and apparently a little more taxing for Gerard, although I wouldn't tell him that given he's accustomed to carrying a blaster. Both, who were there as themselves (not in costume), were fun to see in real life. The Dragon*Con Parade is not your typical parade. There are no politicians, no 300-member marching bands, no floats nor participants that do not directly tie to the theme of the event. 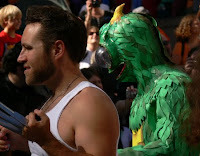 At the Dragon*Con Parade you get super superheroes, alien antagonists and favorite sci-fi/fantasy television personalities…more than I can possibly recall. Will I watch the Parade next year? No, I actually plan to participate in the Parade. So mark your calendars now and check me out when I join the legions of Klingons, vampires, and Wookies…and who knows what else!